Gone are the trench coat, Converse trainers and loose tie, replaced by a tweed jacket, work boots and - wait for it - a bow tie. So what does the new Doctor Who costume say? Another regeneration, another Doctor, another signature look. 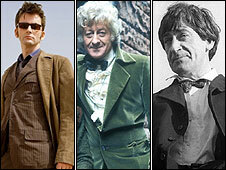 Fans fondly remember Jon Pertwee's bow tie, Tom Baker's scarf and Christopher Eccleston's battered leather jacket. And sometimes what the Doctor wears stimulates more than curiosity. It can re-enforce High Street fashion trends, as David Tennant's trainers did when first revealed four years ago. So the first glimpse of the new Doctor, Matt Smith, filming on set in boots, rolled-up trousers and a bow tie, has sparked huge interest. Within hours, the Doctor Who Online website had received 2,000 comments from fans, overwhelmingly positive. The man behind the new look is Bafta-winning costume designer Ray Holman, who had conversations with Smith over the choices. But is this Time Lord dressed from the past or for the future? Fashion commentators and a Doctor Who expert give their views below, or click on the links on the picture to go straight to each critique. Esquire has given the new-look Dr Who ensemble the thumbs-up, says Jeremy Langmead, editor of the men's magazine. "The cross between rookie geography teacher and Hoxton clubkid works well: a bit of old-school time-traveller meets modern-day adventurer." But Andrew Groves, course director for fashion at the University of Westminster, thinks the get-up is very unflattering. "It seems a curiously British idea to make the lead character in a prime time TV show look purposely and perversely less attractive than they actually are," says Mr Groves. "I can't think of anyone that would look at this image and then decide they would want to stick it on their bedroom wall." Sebastian Brook, editor of Doctor Who Online, thinks the look is very HG Wells' Time Machine, something timeless which marks a clear departure from Tennant but with a nod to the second Doctor, Patrick Troughton. The boots are very on-trend for this autumn, says Mr Langmead, and Matt Smith's are from the Prada autumn/winter collection that has just arrived in the stores. "Monkey boots hark back to the 1980s with a whiff of Greenham Common and pop groups such as the Joe Boxers and The Bluebells," says Mr Groves. "Who actually wears these anymore? Curiously they aren't done up properly, lending the outfit an air of someone that can't quite dress themselves. Rolled-up trousers will be very a la mode next spring and summer, says Mr Groves. But coupled with the tweed jacket and shirt, they look completely unfashionable. A shorter trouser length was first introduced by the American menswear designer Thom Browne a couple of years ago, says Mr Langmead. "It was then adopted by the Hoxton set [a loose collection of fashionable urbanites] who rather than buy shorter trousers, merely rolled theirs up - very credit-crunch friendly." The bow tie is obviously a knowing nod to those worn by some of the previous doctors, yet this also has a fashion resonance," says Mr Langmead. 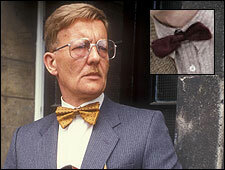 Is Grange Hill's Mr Bronson an inspiration? "Alber Elbaz, the designer behind the trendy Lanvin label, always sports a bow tie and the label's influential menswear line frequently features them. "As a result, the bow tie has had something of a fashion comeback - although it's a hard item to wear; you have to try and avoid looking like Pee-wee Herman [." The bow tie is what makes this look possibly unattainable for fans, says Mr Brook. "A lot of fans liked dressing up as David Tennant. It's a very accessible look they can have, with a pair of Converse trainers and a tie. "But this new look will be more difficult because it doesn't fit in as well, especially the bow tie." The tweed jacket provides another reference to the early 1980s, says Mr Groves. "High unemployment meant that people shopped in second-hand stores to find interesting, hard-wearing and above all cheap clothes to wear. "Whilst David Tennant's Doctor was undoubtedly influenced by Britpop and [the film] Quadrophenia, this Doctor seems to be influenced by Indiana Jones' geekier nephew." The tweed jacket stops Smith from looking too "modern" and adds a bit of Doctor Who history into the mix, says Mr Langmead. "Mixing vintage pieces with new items has been a fashionable look for men and women for sometime now, and is very much how a large part of the show's audience will approach their wardrobes. The shirt and bow-tie could actually be from a number of contemporary fashion designers, says Mr Groves. "Similar ones were spotted at the menswear shows in Milan last month. Spot-on for next season." Mr Brook detects a throwback to the seventh Doctor, played by Sylvester McCoy, who sported a similar shirt. The hair looks much like Matt Smith's own style, and a longer version of David Tennant's. "The haircut works well," says Mr Langmead. "It is quite foppish and eccentric, and somehow ageless - like the Doctor himself. It wouldn't look out of place in a period drama, nor would it seem odd in an episode of Skins." Awful, says Mr Groves, who says it reminds him of early Michael Portillo and does nothing for the actor's wonderful cheekbones. A very disappointing 'look'. There is nothing unusual or defining about the image. He looks like the Jimmy Olsen character from the Superman comic strip. Very boring, no flair, a bit 'preppy' college student. All these fashion designers seem to have missed the style niche. The Doctor is a Time Lord and therefore, one would hope, he's probably pretty post-modern. He looks like a very fashionable Steampunk, punk + Victorian England. Check out the dirty boots rolled up trousers (punk) and tweed, bow tie and gold watch (classically 19th Century). Get your subcultures right guys, you seem a bit out of touch! No no no. A lot of these comments are missing the point - the Doctor isn't a Steampunk character, he's not a superhero either. The last thing we want is another 'carnival' character or "eccentric" fashion statement. Tennant looks like he landed the Tardis in a branch of NEXT.. Perhaps the retro understated look is the new "eccentric", harking back to the Troughton days. A refreshing change. How blisteringly out of touch all the commentators are. Bow ties have been back in the mainstream for about two years, as have the boots. You can buy them both in Top Man, for heaven's sake! I think the Doctor looks cool. Anyone reading this would think David Tennant's Doctor invented Converse trainers, when in fact his look was also pretty mainstream too. It's not so much about what he's wearing anyway; it's down to the scripts and acting. One of the rumours abounded that the new Doctor would look a bit "emo", so dressed in black, with heavy metal inspired t-shirts and waistcoats. I would like to see the whole 'package' before really passing judgement on the clothing, because I would hope they would fit the essentially new character extremely well, but one is left with the feeling of a chance lost to make this Doctor look very different, in comparison to the last two. I think it's utterly lacking in imagination or subtlety. D Tennant managed to look edgy whilst still maintaining a clear English eccentric/fop influence. This look has no edge to it at all. It's an utter stereo-type and a lazy pastiche. VERY disappointed BBC, VERY disappointed. The new outfit makes him look like a young Keith Floyd! There is a theory about bow ties which explains why they're so unsexy. A regular long tie is a phallic symbol, both suggesting the phallus and directing the eye south, and below the belt. The shape and dimensions of a bow tie however reflect the shape of the mouth, suggesting that what the wearer has to say is of more value than the contents of their pants. (This perhaps explains the popularity of bow ties with academics). With James Bond's tuxedo the only exception to the rule, the bow tie is goofy and unsexy: poor Matt Smith has quite the yolk to bear. He is a time traveller! There has to be an era when he'll be in style! I don't think Matt Smith is "in character" in the photographs I've seen. I want to see how he carries off the character, and the costume depends a lot on that. I must be getting old: even the Time Lords are looking young. I don't care how 'fashionable' it is - it looks awful! I know he's 900 years old but the bow tie (unless in tuxedo form) died a long time ago! It seems to be the fashionistas that are wide of the mark. If you allowed somebody from one of the fashion houses or design colleges to oversee the look of The Doctor there's every chance that they would be so preoccupied with what's "on trend" that he'd end up looking quite ridiculous after two seasons. Matt will never slip out of fashion because this look will never even slip in to it. Like a lot of people commenting here, I'm very disappointed with the new costume. Then again, I was also disappointed in the casting of Matt Smith (sorry, I'm sure he's very talented, but he is too young). I'm praying that Matt will somehow carry off the role of The Doctor, but he'll have his work cut out for him given a costume that's so utterly naff. At first glance, it's almost as bad as the appalling costume they made poor old Colin Baker wear. Obviously a change of look was needed after David Tennant's Britpop chic, but there were so many great looks that would have gone well with Matt Smith's features, that I think the Beeb really missed the boat here, dressing him as a 1980s geography teacher.